Swedish winger has been a consistent threat on the scoresheet so far in the playoffs for the Canucks. With a Rough 2 battle with the Blackhawks underway, Samuelsson is looking to keep the points flowing. There was a brief time when Mikael Samuelsson preferred making saves to taking shots. But thankfully for Vancouver Canucks fans, the talented forward chose the right career path. He's been of the hottest players in this year's Stanley Cup playoffs, a constant threat every time the puck touches his stick and a newfound fan favourite in British Columbia hockey circles. So imagine, if only for a moment, that Samuelsson didn't trade in his goalie stick when he was growing up in his native Sweden. Canucks' supporters wouldn't like it one bit. Growing up in Mariefred, just 65 kilometers west of Stockholm, Samuelsson was part of a group of 20-25 kids who spent countless hours on the town's outdoor rink. It was on the ice, though, where Samuelsson shed the goalie equipment for a forward spot. And does he ever think about what the future would have held, hockey-wise, if he had pursued the backstopper's role. Drafted in 1998 by the San Jose Sharks 145th overall, Samuelsson began his NHL career in 2000–01. After short stints with the Sharks, New York Rangers, Pittsburgh Penguins and Florida Panthers, he skated with the Detroit Red Wings after the 2004–05 NHL lockout, remaining with the club for four seasons. 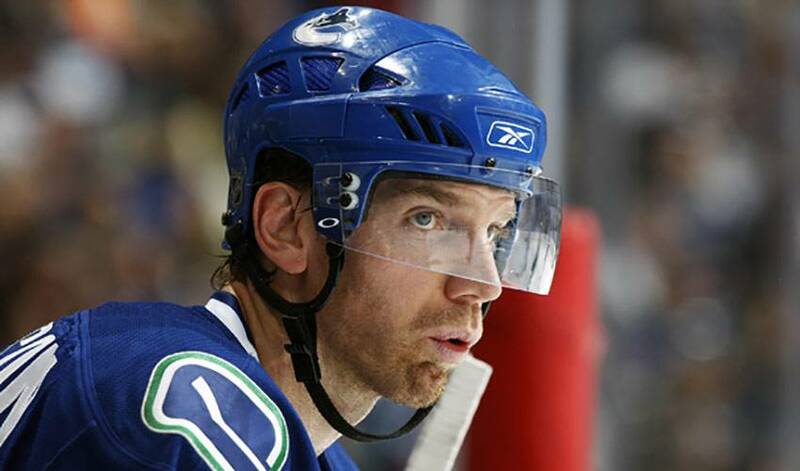 In the summer of 2009, Samuelsson signed a three-year deal with the Vancouver Canucks worth $2.5 million a season on July 3. On the international stage, Samuelsson has won two gold medals in three appearances with Sweden at the 2006 Winter Olympics and 2006 World Championships. He is a member of the exclusive Triple Gold Club, having also won the Stanley Cup with the Red Wings in 2008. His first campaign with the Canucks has been as good as gold, a season in which he reached the 30-goal plateau for the first time in North America. Samuelsson hasn't slowed down at all in the playoffs, averaging more than a goal per game and nearly two points per game after the first round. Samuelsson credits linemates and fellow Swedes, Henrik and Daniel Sedin, for his own personal success. “They are amazing players and for us, it's as though we don't have to think when we are out there,” said Samuelsson. “It's as though we know where we will all be and what we expect next. When we are on the bench, we are constantly talking, discussing what happened the shift before and what we can try to do the next one. Samuelsson is hoping it only gets better as they face-off against the Chicago Blackhawks, the team that ousted them from last year's post-season. It's something Samuelsson is extremely grateful for. Can he even imagine what it would be like if the Canucks delivered the city its' first Cup win? How well do you know Bo? Ben Hutton’s initial introduction to skating was a trying time, to say the least. But thanks to his mother, he soon hit his best stride. Get to know Swedish netminder for the Vancouver Canucks, Jacob Markstrom, who as it turns out has pretty cool ability outside the crease too! For Ben Hutton, having Elias Pettersson as a teammate is music to his ears. Literally. There was one particular Christmas present Chris Tanev pined for when he was 12. GM and vice president of Horvat's former London Knights, Mark Hunter points to underrated elements of the young Vancouver Canucks forward's game.